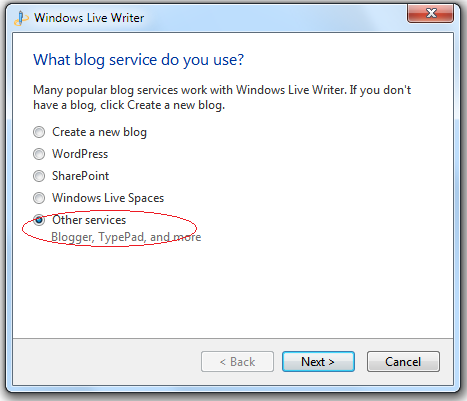 The other day I was asked if Windows Live Writer works with Subtext. My answer was of course! Subtext is a blog engine that focuses on usability, elegance, and simplicity. If you’ve ever caught yourself throwing your hands in the air and declaring that you’re going to write your own blogging engine, then Subtext is for you. It uses ASP.NET and Microsoft SQL server. Wikipedia writes that Subtext was founded as a fork of the BSD Licensed .Text blogging engine written by Scott Watermasysk. .Text went on to be packaged within the Telligent Community product (formerly known as Community Server by Telligent Systems. Subtext is the blog engine used by MySpace for its Chinese site. You can do a one click install of Subtext as part of the Microsoft /web. Here is a link in the Windows Web App Gallery – link. 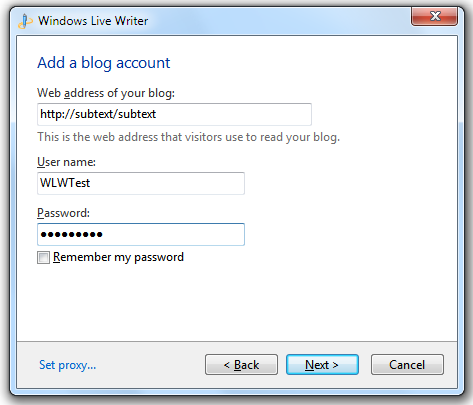 Configuring Live Writer 2011 to work with a Subtext blog server is very simple. Just select Add blog account from the Blog accounts drop down in the Publish section of the Home tab. Next select Other Services and select Next. At this point just enter the URL for your Subtext server and a username and password click Next and you are set! 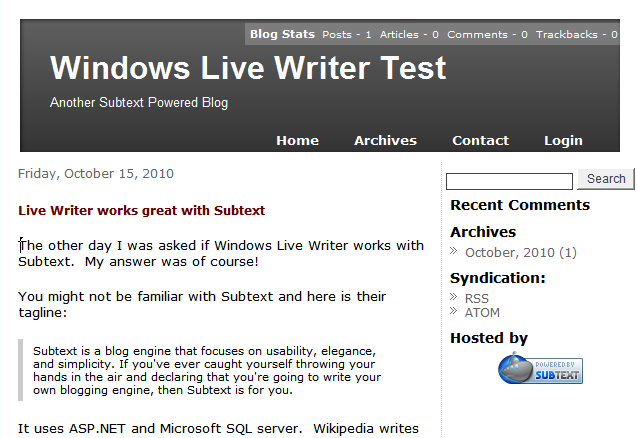 Here is a picture of our test blog running on a Subtext blog server.